Earlier this year, there was a very exciting progress on the drone-discussions front. On behalf of Robots Podcast, I spoke with Peter Asaro from The New School in New York city about autonomous weapons systems. Peter spoke about the Campaign to Stop Killer Robots, an international consortium of NGOs working together to ban autonomous weapons systems. You can read the full coverage on Robohub. 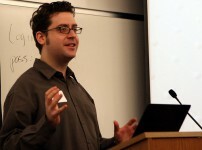 Peter Asaro is an Assistant Professor atThe New School and an Affiliated Scholar at the Center for Internet and Society at Stanford Law School. As a Co-founder and Vice-Chair for the International Committee for Robot Arms Control founded in 2009, Peter has been thinking, talking, and writing about lethal robots for many years. Computer scientist and philosopher by training, he is one of the leading figures in roboethics urging scientists to join the Scientists’ Call to ban autonomous lethal weapons. Next Do robots need heads?